From time to time, I get asked to teach people how to cook. The request usually comes from close friends and typically right after I’ve spent 10 minutes expounding on how anyone who hates anchovies hasn’t tried Spanish anchovies packed in salt or some other obscure topic, in other words, making it abundantly clear that I spend way too much time thinking about food. I am hugely flattered when people ask because I love to share what I know and help people discover how easy it can be to cook at home. When my friend Meghan asked me to help her learn how to cook to “keep her from starving” (her words, not mine), I immediately suggested we make some of the basics I think every cook should know: how to properly cook a chicken breast, a good bolognese sauce and a salad dressing made from scratch. Meghan quickly made it clear that she didn’t understand why she needed to know how to make a salad dressing when she can just buy one at the store. I suppose she’s right and I think most of us will get along just fine never knowing how to make our own salad dressings, but I am of the belief that the five minutes or less that it actually takes to make a salad dressing is time very well spent. When making a salad dressing, a very basic formula to follow is three parts oil to one part vinegar with a little salt and pepper and any additional flavorings you want to throw in. It’s easy to remember, easy to make and will elevate any simple salad you throw together to something just a bit more special. I try to keep vases of fresh herbs on my kitchen counter. They’re beautiful to look at and having them out encourages me to use them more in my cooking – most often they end up as the ‘additional flavorings’ in my herbed salad dressing that I make almost weekly, or as soon as my last batch is gone (I make three or four times what I need for one salad and keep the extra on hand for use throughout the week). I intentionally didn’t specify which herbs to use in the recipe below. You should use whatever you have on hand, or if you’re going shopping, whichever herbs sound best to you. My favorite combinations include chive and basil (one bunch of chives and the leaves from four or five basil stems) and scallion, parsley and mint (two thinly sliced scallions combined with a handful of chopped parsley and a few mint leaves). Tarragon also works brilliantly in salad dressings. The key here is to try your own flavor combinations and determine what you like best. This recipe calls for the best extra virgin olive oil you can afford. Sometimes that means the $6 jumbo bottle from the grocery store. Please know that that is perfectly acceptable here. Since the recipe calls for a good amount of olive oil, I tend not to use my $30 bottle of olive oil because that’s a lot of money going into one salad dressing. That being said, if I could afford to buy a countless supply of $30 olive oil, I would definitely use it in salad dressings because the flavor is so prominent and the quality really does come through. So, use the best you can afford, whatever that may be. 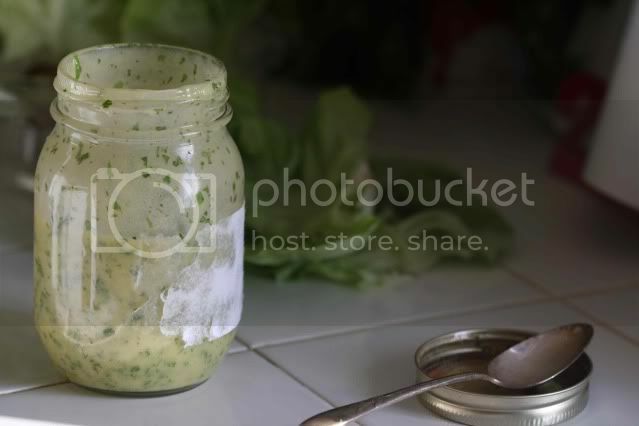 Combine the vinegar, mustard and herbs in a mason jar, screw the lid on and shake to combine. Pour the olive oil in and shake vigorously to emulsify. Season to taste with salt and pepper. If the dressing still has too much of a vinegar bite, add a pinch of sugar to help balance it out. This dressing will keep for about a week in the fridge. I love this post. I can no longer eat dressing from a bottle. In fact, if that is the alternative, then I'll go without dressing. I love salad dressing recipes! Thank you! OMG people BUY dressing? Weird ;P In Italy people even just get given a little stand ith the oil, vinegar and s and p so they can do it to taste. I think they usually do the oil first so the leaves are protected from the vinegar. Anyway, there's *me* expounding, hehe. Champagne vinegar is something I've tried to get here in Austria and I just can't find it...Maybe next time I go on a trip. Mmmmmm! Just what I need to spice up my regular salad dressing recipe! Not a big dressing fan because I've only had it bought from a store. This recipe certainly sounds good so I'll have to give it a try. I'm liking the versatility of your recipe. Also, keeping vases of herbs in the kitchen is a great idea! the dressing sounds GREAT! Would love to see a post of your bolognese sauce! I do the same thing with my dressing! (That is, making extra and using it throughout the week.) Now that I've figured out how to make bleu cheese and ranch dressings, I never have to buy the stuff again! so simple, yet so elusive, a good vinegrette is. this looks divine. I love keeping jars of sauces/goodies in my fridge. Excellent recipe. Anything with chopped fresh herbs is something I am a fan of. Good idea to keep the herbs on the counter top. I think I might start doing that too. It's easy to incorporate herbs into things, but the trick is remembering to do so. Sounds tasty - I'm totally going to do the 'herbs in vases' thing. Too often fresh herbs sit in the bottom of my crisper until they go bad. So when do we get the lesson on how to property cook a chicken breast? I was still pretty new at blogging when I wrote that so if you need any clarification, just let me know! Liz - I just went looking for the Bolognese post because I was sure I'd already written about it, but I have not! I'll add it to the list! 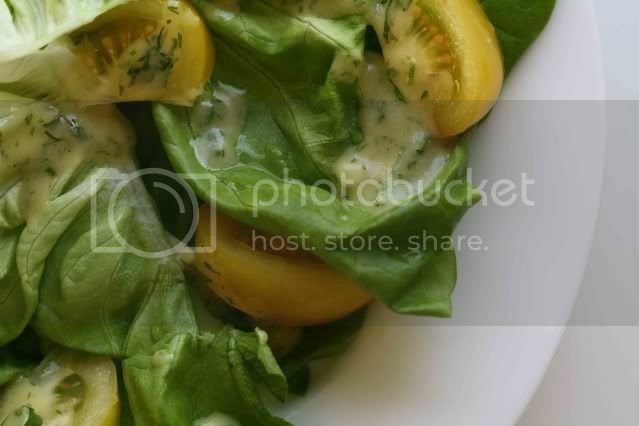 I love this mustard and herb dressing. I am sure it tastes delicious. Love your list of cooking basics. You can go really far with those three items! I make a version of this every night to go on salad. Other fun little additions -- a tiny bit of honey or a squeeze of lemon juice. The dressing looks fantastic!! Yum! I just love the herbs in the dressing. Such a simple recipe but yet the results are full of flavor. I will definitely be trying this. Homemade salad dressing is definitely an underappreciated thing. It's so easy and tastes infinitely better than the storebought ones. I love your mix here. I tend to go off on tangents about food as well. And think about it constantly. It drives people slightly crazy at times but makes me super happy. I love imparting knowledge where I can. Sometimes I get sick of the ole yoghurt and mustard honey dressing and need a good change. I like the sound of this one. But I've never seen champagne vinegar around here before. I wonder if it could be substituted with something else? I have been really trying to make more salad dressings at home and now I've just found another one. It really is quick and easy to make salad dressing from scratch. I also make mine in mason jars. Thanks for sharing! This is similar to my recipe. I use garlic rice vinegar in mine. I love the fresh taste of a just made dressing, and I can just mix up enough for a single salad easily. I highly doubt a store bought salad dressing could ever rival homemade. I'm sure your friend realized that the moment she tasted yours. I'm convinced you could have sold her on the idea by simply showing her your first photograph--very enticing. I used to go the bottled salad route until I discovered just how easy it is to make it from scratch. It's so worth that extra time/effort -- I wouldn't even consider buying a bottle now! I completely agree that it's important to have homemade salad dressing on hand. Having said that I never seem to be organised enough to have a fresh weekly supply. I'm inspired to now go and make up a jar of your dressing. Thanks! Would you sometime expound a bit on various vinegars to use in our home-made salad dressing. What about fruity dressing? Any suggetions? Thanks. Love to cook and just discovered your blog.Will be back!